The other problem has been the swell of talent in the industry’s top ranks. 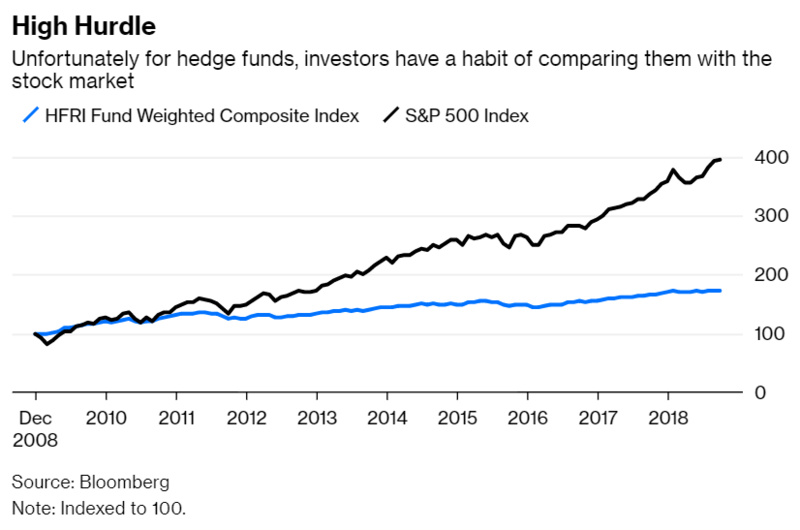 Investors tend to think about the golden age of hedge funds as a can’t-miss proposition: Pick any fund and watch your money soar. In reality, that reputation was cultivated by a smaller group of skilled managers who delivered jaw-dropping results while most others proved to be poor imitations. But as more talent entered the game, even the best managers struggled to re-create the old magic. 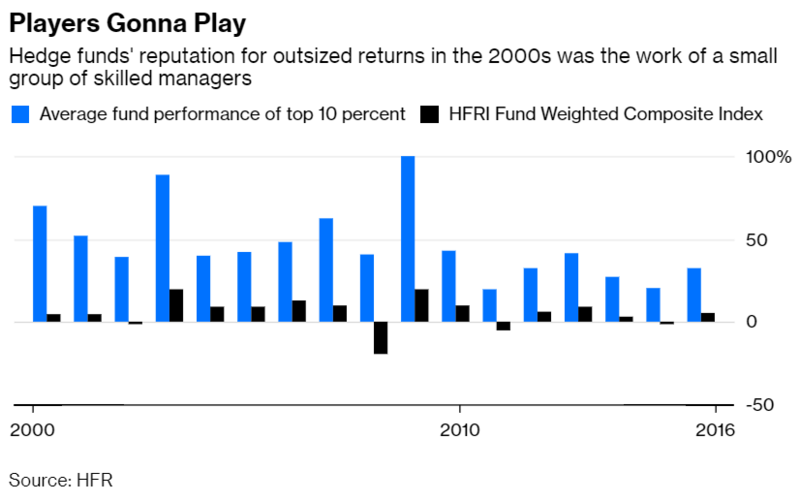 Consider that during the decade from 2000 to 2009 — a period remembered fondly by hedge fund investors — the top decile of hedge funds in the HFRI Fund Weighted Composite Index generated an average annual return of 58 percent. Those elite managers also deftly navigated the 2008 financial crisis, generating an average return of 41 percent in 2008 and 100 percent in 2009. Few others performed as well. The HFRI index returned just 6.4 percent a year during that decade, while the index’s bottom decile posted an average annual return of negative 22 percent. And both stumbled during the financial crisis. The index declined 19 percent in 2008, while the bottom decile was down 62 percent. Now consider what happened during the seven years that followed — the most recent period for which full-year returns are available for the top and bottom deciles. 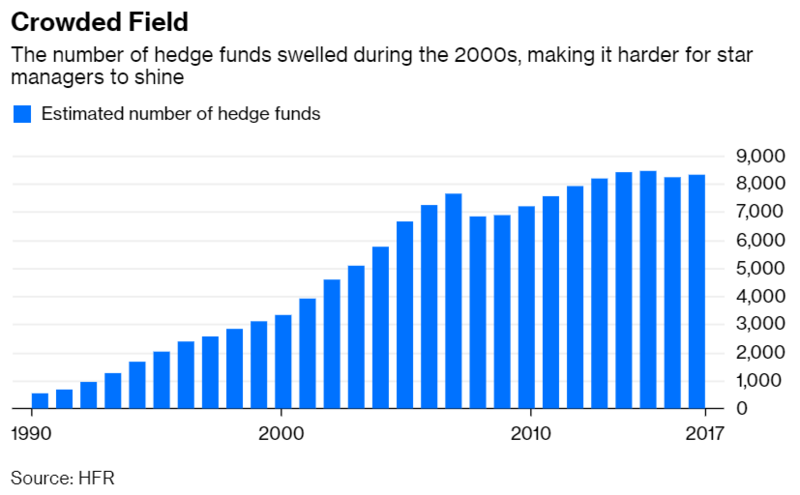 The number of hedge funds ballooned to roughly 6,900 by the end of 2009 from 3,100 when 2000 began, according to HFR. That had little impact on the performance of the HFRI index or the bottom decile of funds. The index returned 3.8 percent annually from 2010 to 2016, while the average annual return of the bottom decile was a negative 20 percent. By contrast, the industry’s growth had a huge impact on the top performers. The top decile of the HFRI index more than doubled in size, and its average annual return dropped to 31 percent from 2010 to 2016, or 27 percentage points less than the preceding decade. None of this is unique to hedge funds. Competition has had a disproportionate impact on top-performing private equity funds, too. The top quartile of funds in the Cambridge Associates US Private Equity Index posted an average annual return of 23 percent from 1993 to 2002, the first decade that numbers are available. But as the number of funds in the top quartile grew, the returns began to suffer. The average annual return dipped to 18 percent in the ensuing years from 2003 to 2016. By contrast, the average annual return of the funds in the bottom quartile was 5 percent in both periods. U.S. stocks will eventually stumble, making it easier for hedge funds to compete. But keep an eye on the ranks of top hedge fund managers. The more they bow out, the brighter the future may become for the remaining stable of stars and for the entire industry. Previous PostPrevious Investors Are Supposed to Be Rewarded for Risk, Right?